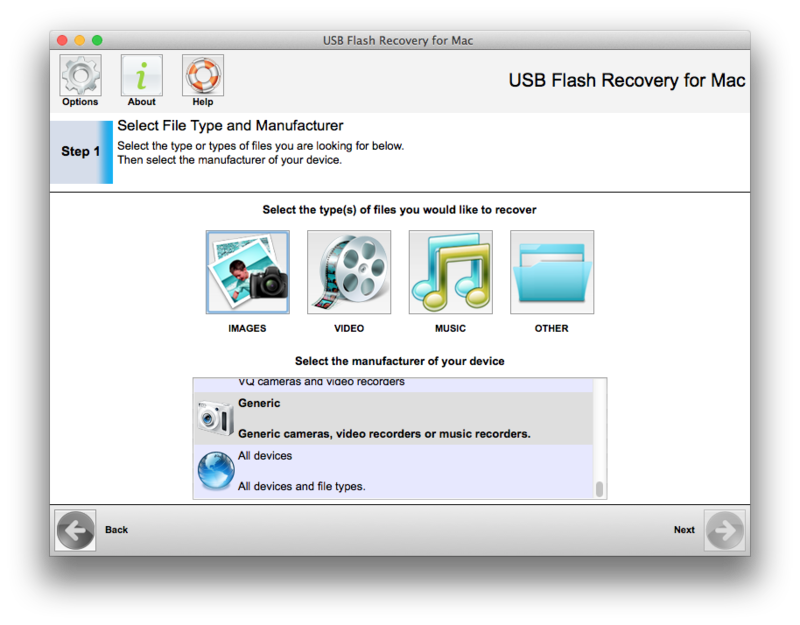 321Soft USB Flash Recovery for Mac is an advanced software tool specifically developed for USB flash drives and memory card. It can recover photo, video documents, and other files from USB drive, flash memory card, memory sticks, CD/DVD, iPod, mobile phones and virtually any type of data storage device that work as a removable storage. If your files were lost, unintentionally deleted, formatted or corrupted by viruses, 321Soft USB Flash Recovery can help you restore them quickly and affordably. Also, you can create image of the attached storage media, so that you can restore your precious photos and other files, if the device gets damaged/inaccessible. The simple, intuitive software features a wizard-driven interface, allowing even the most novice users easily to recover lost files. Moreover, This software supports recovery of high-end RAW photo formats and HD video that are generated by professional digital cameras like Canon, Nikon, Olympus, Sony, Pentax, Fuji, Panasonic, etc. The trial version of 321Soft USB Flash Recovery for Mac allows you to scan and preview all recoverable files before purchase. and all data recovery operations are secure as the software does not write recovered data onto the drive it is scanning. It fully compatible with Mac OS X 10.6, 10.7 and 10.8 (Snow Leopard, Lion, and Mountain Lion). Private bookmark manager, that enables you to efficiently organize large ammounts of Internet bookmarks and local links. The program supports all major Windows browsers: Google Chrome, IE, Opera, Safari, Firefox. Belkasoft IE Favorites Extractor allows you to extract your MS Internet Explorer Favorites into numerous formats such as plain text format, HTML and XML. You can also manage the way of how these formats are generated.